But what about gender? The way in which gender cuts across race and class, or is restricted by race and class, provides the theme for the central narrative of Kansas City. Robert Altman's metaphor is the jazz music of the thirties, which emanated from Kansas City as the earlier jazz had come from New Orleans. In a jazz-like embellishment, a much more complex exploration of the relationships between the characters is built around a simple plotline. As with jazz improvisation, it is this interplay which gives the film its fascination, rather than the question of how the plot will be resolved. 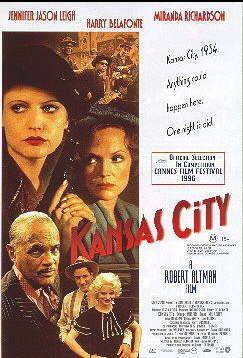 The plotline of Kansas City is quite simple: Johnny O'Hara (Mulroney) crosses local black mobster Never Seen (Belafonte). Never Seen in turn grabs Johnny and sits him in a back room of the Hey Hey Club while he ponders a suitable retribution. Johnny's wife Blondie (Jason Leigh) kidnaps Carolyn Stilton (Richardson) to force her husband, a Democratic Party political heavyweight, to pull strings within the local Party to get Johnny back. Blondie knows that the Democratic Party in Kansas City has connections with some particularly unsavoury thugs who help with election-rigging. The chain of command goes from Henry Stilton, an advisor to Roosevelt, to the state governor, to the local party boss Prendergrast, to his organiser to these thugs. By putting pressure on Stilton, Blondie hopes to force the thugs to get Johnny back. The chain of communication between Blondie through the layers of the Democratic machine to Never Seen illustrates the gender distinction which the film explores. The communication between the women is direct, Blondie crosses class boundaries to kidnap Carolyn, while the communication between the men is strictly hierarchical (Henry is horrified when the Democrat paid thugs come to his house, since the hierarchy has been upset). It is in challenging this hierarchy that Blondie plays with fire. The distinctions of class and race are experienced differently by women and men. Carolyn, once kidnapped, enters a world she did not imagine existed, one which is overwhelmingly feminine. Blondie continually encounters women who communicate across race and class boundaries: Addie Parker, the mother of future jazz great Charlie, who helps Blondie at key points. The social worker Nettie who helped Blondie when she was pregnant out of wedlock and is also helping a young black woman, Pearl. Although they never communicate as equals, they have direct contact with each other while the men communicate in a very structured manner. Moreover, there is very little direct contact between women and men. Addie Parker's house is populated by women (and young Charlie, who crosses these boundaries). Henry Stilton is both geographically and emotionally remote from his wife. Blondie's only contact with men throughout the film is with her grotesque brother in law, Johnny Flynn played by Steve Bescemi. The world of Kansas City is represented as a gendered space, with few points of contact. The key question the films poses is whether these women can cut across the boundaries of race and class, a question explored in the relationship between Carolyn and Blondie. The film is an awakening for Carolyn, as she toys with the persona of Red given her by Blondie. As she slowly recovers from what appears to be a very long narcotic trip (Carolyn dulls her senses with laudanum), the world comes back into focus and she gains self confidence. Carolyn is faced with a choice between embracing this new feminine world or returning to the privileged but suffocating patriarchy from which Blondie has kidnapped/rescued her. Is it possible for Carolyn to transcend her race and class position? In a bleak and shocking ending, the film answers in the negative: there ultimately is no sisterhood here. The film is replete with cinematic references, the most obvious, and amusing, is Harry Belafonte, looking like Don Corleone in black makeup. This touch resonates with the mythologising of gangsters, but Never Seen is not allowed to become an endearing character. He is permitted to philosophise about the state of race relations in the U.S. in the thirties, and his redeeming feature is his love of jazz music, but these are counter-pointed with his violence, which is callous towards other blacks and sadistic towards the white trash Johnny O'Hara. The acting throughout is excellent, from Michael Murphy looking like a young FDR, to Steve Buscemi for once not overacting. Harry Belafonte, Jennifer Jason Leigh and Miranda Richardson provide stunning performances, with Richardson perhaps shading Jason Leigh for the honours. And finally, there is the background of jazz music, which sets the tone for the narrative, as well has providing its own highlights, recreating an all night cutting-contest between Coleman Hawkins and Lester Young. 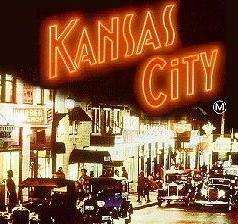 Kansas City is a magnificent film in any estimation.